Food, clothing, tools, toys, business packages – virtually any product you can think of – are items that run through distribution centers on their way to homes and businesses all around the world. Before any of these products reach a customer they must be transported from the manufacturer to a retailer or warehouse before they are delivered to the end customer. Growth in e-commerce has fundamentally changed the way we do business and also the way products are stored and shipped. In 2012 Fed Ex and UPS reported a rate of 25 million packages a day go through their facilities. By 2013 Walmart was shipping 81% of all merchandise sold through one of their distribution centers. While larger retailers sell thousands of products in stores, their distribution centers become the foundation of their supply networks. This allows a single location to stock a wide variety of products and efficiently ship them back out to individual retail store locations or directly to the homes of customers. (Distribution centers can also be referred to as a “DC”, warehouse, fulfillment center, a cross-dock facility, or bulk break facility.) Although each of these may service different segments of the market they all have a variety of belting applications, which means unlimited sales opportunities to you. Live roller applications are found in many of these facilities and we offer a wide range of products to service them – from friction pad and power gravity roller belt to standard interwoven PVCs. There are singulator lines, brake-spacer belts, high speed wheel diverter lines, and tote conveyors. When it comes to distribution centers, you name it, and we carry it! Today one of the main concerns for these centers is quieter service. We have a wide range of belting that offers a quiet weave for low noise decimal ratings. When conveying totes on inclines or declines, a dusty environment can cause lots of problems. 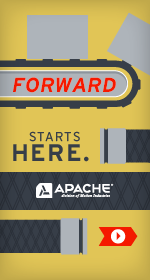 Apache's Industrial Division has several longitudinal ribbed belts that solve this problem. Let us know how we can partner together with you and provide solutions to meet you customer’s needs!